Don’t you just love those beautiful leaning ladders for displaying quilts? I know I do, but I didn’t want to pay upwards of $200 for one. I knew my husband and I could do a DIY for a LOT less, and we did, we made ours for under $20! We purchased the boards and wood screws at Home Depot. Any big box hardware store should carry all other supplies and tools. I should note that that was our price was less than $20 because we had the additional necessary items on hand: paint brush/foam brush, wood stain, polycrylic protective finish, paint, primer, a variety of sandpaper and the tools. If you don’t have these items, it will cost more, but nowhere near what a retailer is asking. I was so happy with the first one, I asked my husband to help out again and we made a second one. I finished them differently; the first one I stained and the second one I painted white. That way, I can move them around the house and always have a fresh, new look. The time spent on each ladder varied. Estimated time on construction was about 2 ½ hours and it took about 3 – 3 ½ hours to sand, stain and apply polyurethane. It was much more time consuming to paint. I applied one coat of primer and four coats of paint, which took several hours, but was worth it. I love both results. Finished ladder measures 6′ H × 19″ W × 1 ½″ D.
If you’d like to make your own, click here for my downloadable PDF DIY Quilt Ladder Tutorial. The tutorial is easy-to-follow with step-by-step instructions and plenty of photos. Here’s to creating and saving a ton of money at the same time! Looking for a fun and decorative way to showcase your orphan blocks? Make a zippered pillow cover! It’s quick and easy enough for beginners, and it’s a great way to use some of those set aside blocks. 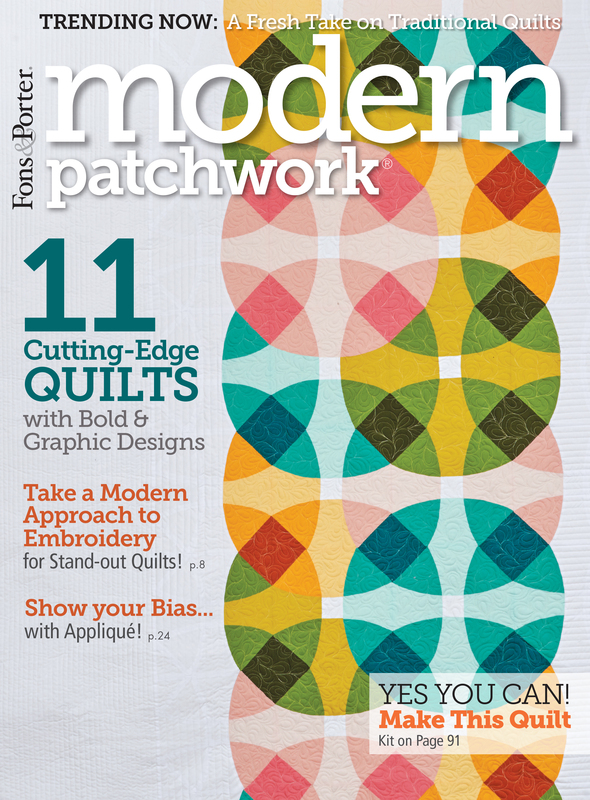 If you’d like something new, visit McCall’s online library of over 150 free quilt block patterns. For a different look, I wanted my pillow front just pieced, not quilted. I also wanted to be able to change the cover for different seasons or holidays, so I added a zipper. And I made it reversible. We put lovely fabrics on the back of quilts, why not on a pillow? I used a fat quarter from the Acreage collection by Moda, it added just the right touch of color. This tutorial is based on applying fusible fleece to the non-quilted pieced front. I knew that inserting and/or removing the pillow form would make a mess of the raw edges so I adhered fusible fleece to seal the seams and give it a smooth, crisp look. Quilting your block is certainly an option and if chosen, you can use either the batting of your choice or the fusible fleece. * If using a block size other than 12 ½” square, adjust your border measurements accordingly. The front and back pieces measure the same size as the pillow insert so it will fit nice and snug. Other materials needed: General sewing/quilting materials such as a ruler, cutting mat, rotary cutter, thread, scissors, pins, iron, sewing machine, zipper foot. To make the front, I used 36 – 2 ½” half square triangles from the lovely Riley Blake collection, Floriography. I removed most of these HSTs from test blocks for reuse. I sewed the HSTs in a simple six by six layout making a 12 ½” block for the center. Tip: If you don’t use a marking system like illustrated here, it’s a good idea to take a photo once the layout is decided; it’s a helpful reference when sewing. To reach the 18″ needed for the pillow front, I sewed one 3 ¼” x 12 ½” rectangle on each side. For the top and bottom borders, I sewed a 3 ¼” square on each end of the two remaining rectangles, then sewed them onto the top and bottom of the block. NOTE: If you are new to quilting and need instruction on making half square triangles and/or instructions on block construction, check out my Scrappy Heart Block Tutorial for general guidelines. Before adhering the fusible fleece, trim threads off the back so nothing will show through the front. Following the Pellon 987F Fusible Fleece instructions, iron the 18″ square onto the back of your pillow front. Since I used regular quilting cotton fabric for my back piece, I used lightweight interfacing to give it a bit more stiffness and weight. NOTE: You always have the option of using your choice of interfacing, or none at all. The same goes for the fusible fleece weight on the front, you can go loftier or with less loft. Next step, sewing in the zipper. If you’re feeling intimidated by this, don’t! It’s really easy to do. First, place your pillow front and back pieces right sides together. Make sure to note the direction of your fabrics. Center the zipper on top of the bottom edge of the pillow. Place a pin to mark each end of the zipper. These will be guidelines on how to sew the bottom. Set the zipper aside. Using a ½” seam allowance and a standard stitch length, sew from the edge to the pin. Once you get to the pin, take a few backstitches. At the pin, set your sewing machine to the widest stitch possible (mine was 5). Long basting stitches are used because they’ll be removed later. Press seam open. It’s best to use a towel over the seam so you don’t get residue on your iron (like I did). Place the zipper facing down and centered onto the pressed open seam. Pin in place. Sew in the zipper using a zipper foot. Leave the zipper completely closed. Start sewing at the end with the bottom stop (make sure to backstitch). Sew until you are a few inches away from the zipper pull, stop with the needle down. Gently unzip the zipper until it clears your foot (place the point of your seam ripper into the zipper head then use it to help slide the head out of the way). Resume sewing. Sew until you reach the top zipper stops, backstitch. Make sure the zipper pull is sticking up/out when sewing down second side. Once the zipper is sewn in, gently remove your basting stitches with your seam ripper. Once stitches are removed and threads are cleaned up (a lint roller and tweezers help), test the zipper—it should work perfectly! To reinforce the zipper, you can sew vertical stitches at both ends. Time to sew the pillow cover closed. First, unzip the zipper at least half way. Keeping right sides together, pin the remaining three sides. With a regular foot and a standard stitch length, sew around the edges using a ½” seam allowance. To reinforce your corners, backstitch about a ½” away from each edge. Almost there! Trim the corners so they’ll look nice and sharp when the pillow cover is right side out. You may need to use a blunt pointed object to help push out corners once turned. Also, it’s worth the few extra minutes to run a zig-zag stitch around the edges to keep them from fraying, or of course if you have a serger, it’s a great time to use it. Trim any remaining threads. At last, turn pillow cover right side out and insert pillow form. You’re done!